You are currently browsing the Bookmobile News weblog archives for September, 2013. And big thanks as we say goodbye to the wonderful staff of the COTS Mary Isaak Center, who have been our donation stalwarts for the past four years. 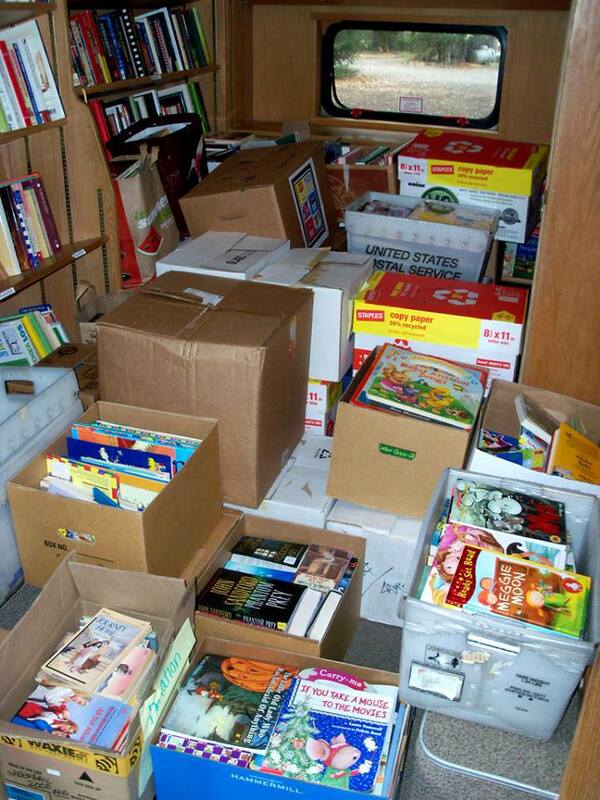 Tens of thousands of your books have passed through their hands to help make the Free Bookmobile such a fun place to browse. That’s a lot of bags and boxes to lift and store for us! They’ve earned a well deserved rest as we pass the baton across town to Argent Bank. The results are in: our big summer book drive brought in 4,935 children’s books for the Free Bookmobile’s shelves! This will ensure that we can continue to reach the most access-challenged kids throughout Sonoma County with great reading material this fall. Special thanks to all the folks who stopped by with well wishes (and books!) at United Way’s Day of Caring on September 11, and of course to our major partners in this endeavor (see post below for the complete list). Check out just a small portion of our haul in the photo, filling up the back of the ‘mobile. It’s like Christmas come early!